Earlier this week I received my first physical item from a Kickstarter campaign. I’d had a few digital deliveries previously, but they didn’t really provide the sense of actually contributing to something in the way that opening this box to find an awesome boxed game waiting for me. Something I could physically hold. Plus, it came with a bunch of cool little extras. 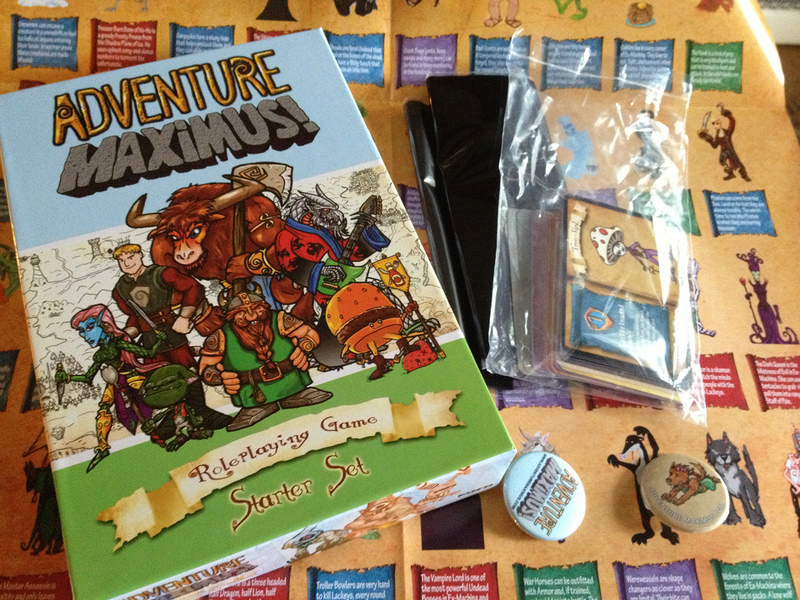 Adventure Maximus is a kid-friendly card-based roleplaying game created by local dev Eden Studios. These are the guys behind the Buffy RPG and, probably more importantly, AFMBE. I’m (almost) always happy to help a local business, but when it comes to games and they’re creating something that can be enjoyed by pre-D&D aged kids, I’m more than happy. I haven’t had a chance to dig through everything in the box quite yet, but I’ve flipped through most of the cards to find nothing but awesome. I’m really looking forward to playing this with my daughter when she’s old enough to hold a few of these cards, but for now I may have to settle for a few solo games.